Surrounded by China, Nepal and Bhutan, Sikkim is known as the Himalayan Shangri-las. 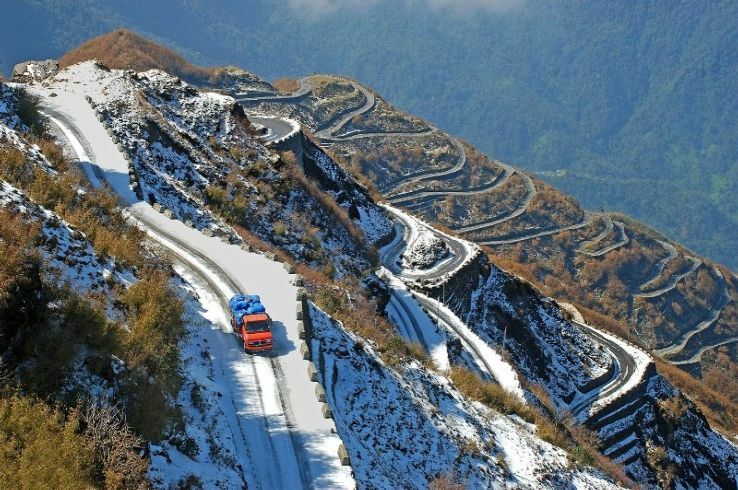 Sikkim is surely one of the most energetic and refreshing places for snow lovers in India. It soothes your soul with its chilly weather, mountains, snowfall and monasteries. There are many places in Sikkim for snowfall. It is a natural beauty to behold. 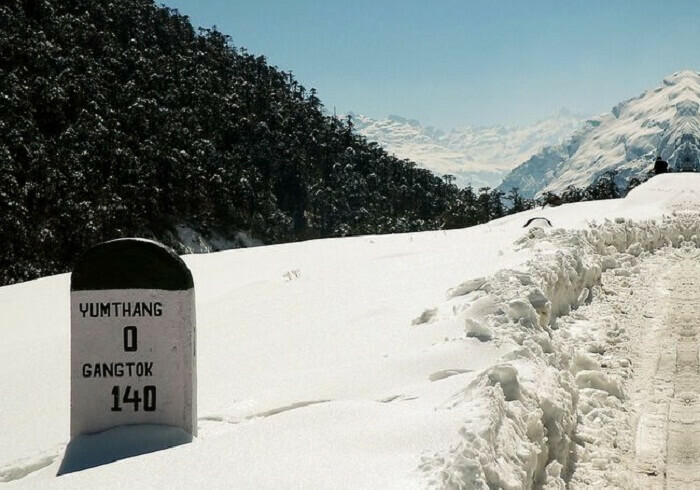 In this article, we shall name the top places in Sikkim for snowfall. 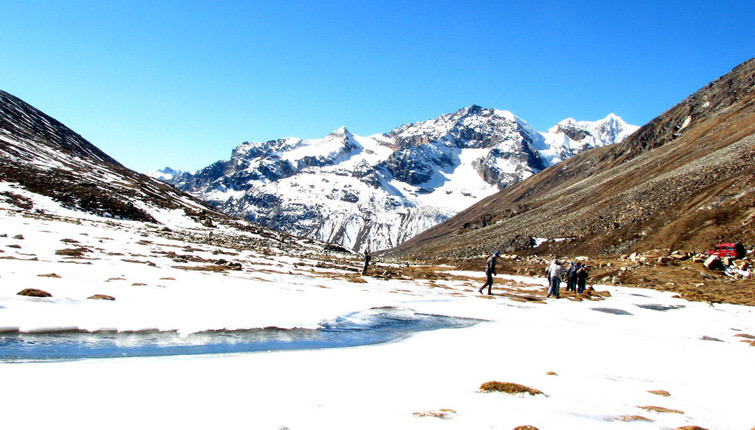 Let’s explore places where you can find snow in Sikkim. Gangtok, the capital of Sikkim is situated on a cloudy ridge 5,500 feet above sea level. When the cool clouds clear, one can gaze all the way up at the soaring peaks of Khangchendzonga which is the world’s third-highest mountain. As a matter of fact, Khangchendzonga National Park is also listed as a UNESCO World Heritage site. Snow trek is popular here and so is snowfall. The nearest airport is at Bagdogra located about 45 minutes from Siliguri. It is indeed one of the best places in Sikkim for snowfall. 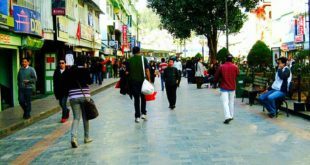 Far away in North Sikkim about 6 hours from Gangtok and 9,000 feet above the sea level lies one of the great snowfall destinations in Sikkim. Situated near the Tibetan/Chinese border Lachung and Lachen dazzle its guests with pristine scenery. Lachung earlier served as a trading post between Sikkim and Tibet prior to Tibet being annexed by China. Now, Lachung and Lachen is the base camp for the renowned Rhododendron Valley snow Trek from Yumthang Valley to Lachen Valley. Lachung monastery and Yumesamdong (Zero Point) are other great attractions in this area. Pelling about 3-4 hours away from Gangtok is a small town and a great place to enjoy unparallelled views of Mount Khangchendzonga if the fog does not play spoilsport. You can feel the chilly snow and be fascinated by the snowfall. Staying at Ifseen Villa though of high budget can give you a spectacular viewpoint. 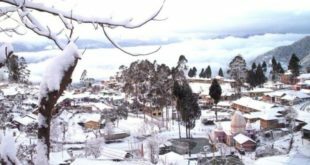 Of the various snowfall places in Sikkim, this is an untouched snowfall destination for those who want to primarily get off the tourist trail. 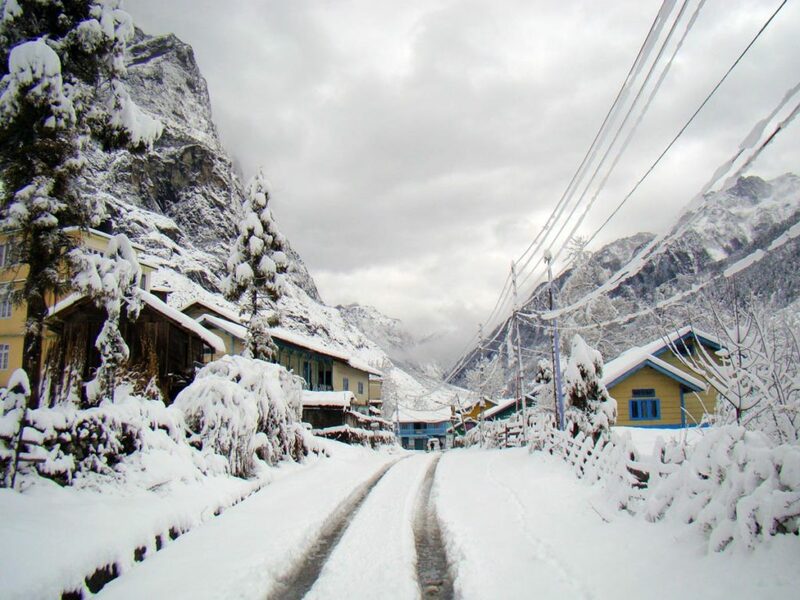 Zuluk is actually a tiny village about 10,000 feet above the sea level situated in Eastern Sikkim. Being a part of the Old Silk Route for traders that connected Kalimpong in West Bengal to Tibet it is the first rare village along this route to offer homestay accommodations for tourists. Though it is filled with wildflowers from August to September, starting from January until April it is carpeted in snow and after the snow clears its abundant bird life can be truly witnessed. 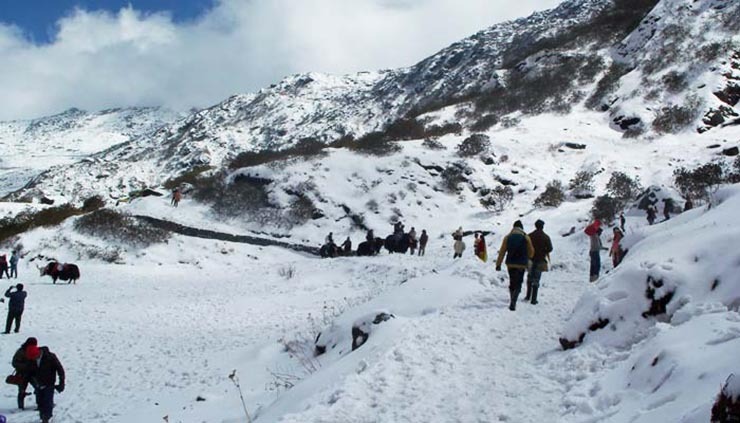 Sikkim is a snow trekker’s paradise in winter. Historical Yuksom is actually the gateway for treks towards Mount Khangchendzonga. 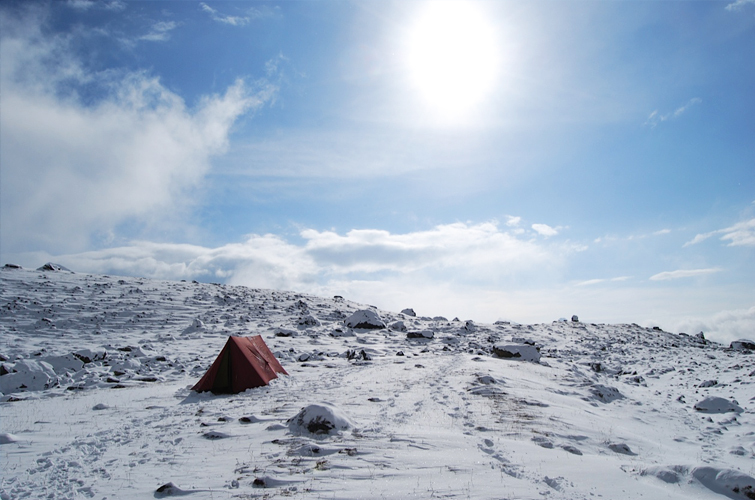 It is bestowed with natural mesmerizing beauty and uninterrupted trail for all trekkers. Sikkim is a paradise in the east for snow lovers. The trail from Yuksom to Dzongri Peak and Rathong Glacier going further on to Goecha Peak is wonderful in the winter season covered with the pristine bliss of snow. 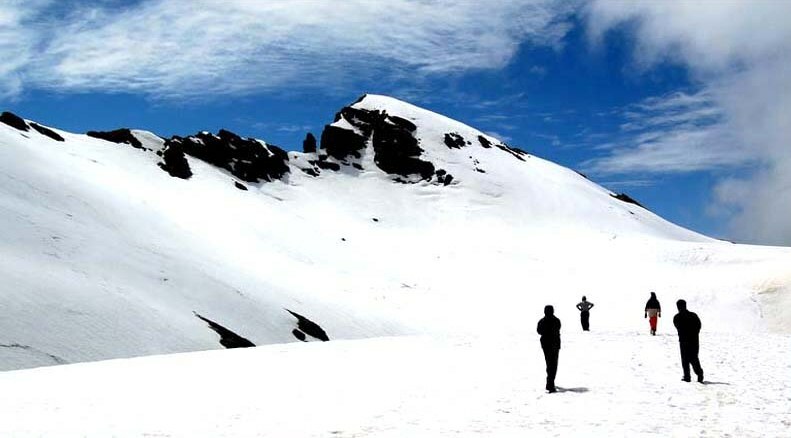 Nathula pass is situated 3 hours east of Gangtok and is at a spectacular high-altitude of 12,400 feet where the glacier lake remains frozen until May. For a quirky winter snow experience you could ride a yak there while enjoying the snowfall! 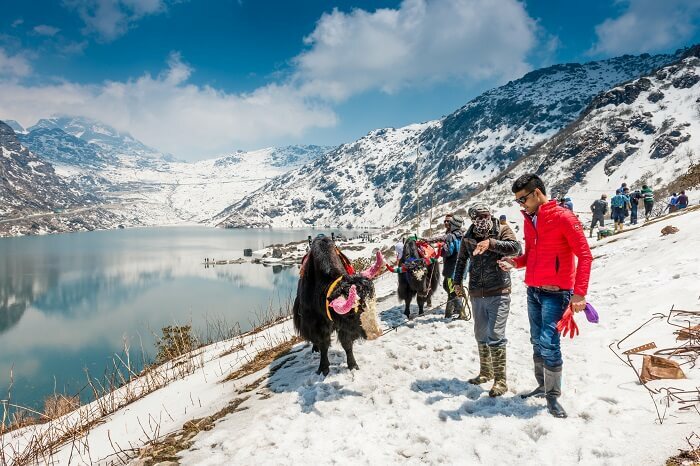 One of the best places to see snowfall in Sikkim, Tsomgo Lake, also popular as Tsongmo or Changu Lake is in fact a glacial lake in Eastern Sikkim situated about 40 kilometres from the capital city of Gangtok. Located at an elevation of 3,753 m (12,313 ft), the lake not only remains frozen during the winter but also witnesses wonderful snowfall.The lake surface reflects varied colours with the change of seasons. Gurudongmar Lake is the highest lake in Sikkim and also among the other lakes in India and all over the world. 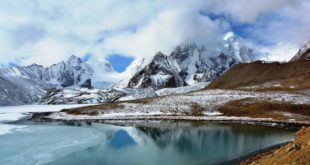 Located at an altitude of 17,800 ft (5,430 m) above the sea level the lake is fed by glaciers and is situated to the north of the Khangchendzonga mountain range. 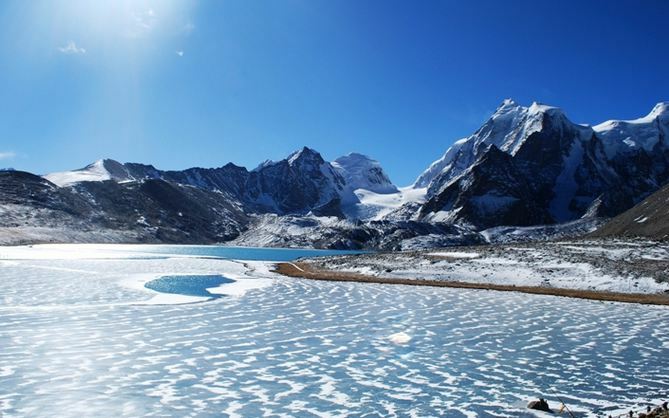 Connected with the Tibetan Plateau, the lake remains entirely frozen in the winter from November to Mid-May and witnesses lovely snowfall. The Yumthang Valley also well known as the Sikkim Valley of Flowers sanctuary is a natural sanctuary with hot springs, rivers and yaks with grazing pasture on rolling meadows in winter. Enveloped by the Himalayan mountains in North Sikkim this valley is a sight to behold in all seasons. Being at an elevation of 3,564 metres (11,693 ft) above the sea level snowfall can be witnessed here. It is at a distance of 150 kilometres (93 mi) from the capital city of Gangtok.